Moat Brae House was designed in 1823 by Walter Newall, South West Scotland's most distinguished architect. The garden of Moat Brae house is, then, the inspiration for Peter Pan. The house, Category B listed in 1961, is exceptionally fine - indeed of better quality than some contemporary A-listed houses in the New Town of Edinburgh. 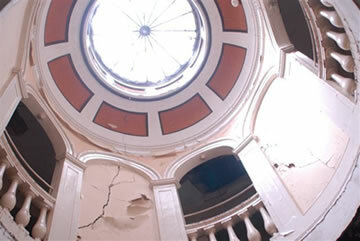 Apart from the problems associated with recent vandalism and decay, the house is in remarkably original condition. Moat Brae was purchased in 2008 by Loreburn Housing Association (LHA). Since then, wet and dry rot have spread extensively and thus the internal fabric of the house has deteriorated dramatically. In May of this year, to the shock and dismay of the local community, LHA announced their intention to demolish the house. As a result of the public outcry, an alternative solution was proposed: the establishment of a Building Preservation Trust to save this important and much-loved house and its garden. Historic Buildings Preservation Trusts (BPTs) are charities established to preserve buildings of architectural or historic importance whose survival is threatened and for which an economically viable solution is beyond the reach of both the original owner and the normal operation of the market. BPTs are usually constituted as companies limited by guarantee and have charitable status. The reason given for the proposed 'urgent' demolition is that the house is in danger of 'imminent collapse'. The Peter Pan Moat Brae Trust’s specialist consultants have confirmed that this is most certainly NOT the case. Moat Brae is NOT about to suffer a 'catastrophic collapse' and presents no danger to the public. We (Peter Pan Moat Brae Trust) have been working behind the scenes to prevent LHA from demolishing the house. Meetings have been arranged with LHA and their solicitors in order to try to negotiate an immediate purchase of the house and garden at Moat Brae. Please email friends@moatbrae.org if you would like to become involved; or to offer your support – specific or general, in cash or in kind.